Painters Inc. Limited was incorporated in 2006 and is owned by Damian and Fiona Palmer. 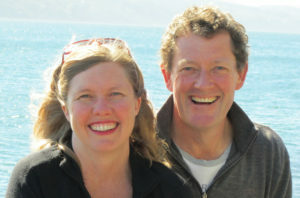 Damian and Fiona both come to quote on your property and like to get a good grasp of what your expectations are. We then collaborate to put together your quote and job specification. Damian is also very much on site to make sure our projects are running to plan. You can contact Fiona, who works full time in the office handling the administration, to arrange a quote anytime on 0800765137. Damian has a number of years experience in the painting industry, working mainly in the residential sector. Our employees are employed full time and are experienced tradesmen with fantastic skills and a keen eye. Painters Inc. do not contract out our projects to other painting teams. We have extra staff for the busy spring/summer painting season who have worked for us for a number of years. We have a great team who work very hard to produce an exceptional standard of work. Our staff are honest, conscientious, professional and hard working. We believe in keeping the lines of communication open at all times. We are a member of Master Painters New Zealand and a Resene Eco.Decorator. The health and safety of our clients and our team is very important. Painters Inc. Ltd is a member of Site Safe and HazardCo. Damian and two other members of our team have also completed a Workplace First Aid Certificate.